I had seen many Gardasil commercials on television and wanted to be ‘one less girl’ affected by cervical cancer. My doctor said I needed the HPV vaccine and I trusted the information I was given. I believed the vaccine was important for my health. I chose to get vaccinated. I was not told that regular pap smears were an effective way to detect abnormal cells which could be treated before they developed into cervical cancer. I was not told the vast majority of HPV infections would clear up on their own with no health consequences. I was not given adequate information about the adverse reactions that could occur after Gardasil. I had never taken the time to research Gardasil, or any other vaccines. I believed vaccines were simply a part of the ‘healthcare’ system; a system I trusted. I did not know vaccinating while your immune system was compromised could exacerbate the risks of adverse vaccine reactions. My doctors didn’t warn me. I wish I had known then what I know now. I have been dealing with spinal issues and pain since I was a teenager. Nevertheless, I worked nearly full time at a physically demanding job and attended classes part time. In October of 2010, I had another injury that put me out of work. Because of this injury, I was prescribed heavy doses of muscle relaxers by my doctor. I had been taking those medications for six months. The muscle relaxers were causing gastrointestinal (GI) complications in my body, exacerbating GI issues I already had. So, I weaned myself off the medications a couple weeks before my upcoming OB/GYN checkup. I thought this appointment would be beneficial, and I was happy to be off the muscle relaxers two weeks prior. I was hoping to keep what small progress I had going. On January 29th, 2011, at 23 years old, I went for my Gynecological check-up with my fiancé to discuss birth control pills and the HPV vaccine. Trusting my doctor’s advice, I got my first injection of Gardasil that day. Within the first few days and for the week after the Gardasil shot, I was bedridden, sick with what we thought was a bad flu. It was also possible I was having a reaction from the muscle relaxer withdrawal or the side effects of my newly prescribed birth control pills. I stopped taking the birth control pills after eight days and my symptoms worsened. My mother and fiancé remember the physical changes when I wasn’t feeling well, but those few days after Gardasil have blurred together for me. I was so sick. During the days, weeks and months to come, I experienced the worst nausea, weakness, vomiting, and most severe pain in every crevice of my stomach and body that I have ever felt in my life. Even the other stomach sensitivities and spinal issues I had experienced previously absolutely paled in comparison to what happened to me after getting Gardasil. We went to every doctor appointment and tested everything we possibly could. The tests kept coming back ‘normal’. (Ironically, they never tested for metal poisoning, which I expressed symptoms of. If any doctor would have known those symptoms, I had nearly all of them, perhaps I wouldn’t have suffered for so long.) None of the doctors said there could be any connection with Gardasil. In fact, most told us just the opposite; that my symptoms were definitely not caused by Gardasil. It was not until blood tests taken outside of my doctor’s office nine months later that we discovered the toxic stress, deadly amount of candida (yeast), metal poisoning and other toxins were filtering through my bloodstream. (Gardasil ingredients included; we finally connected it with certainty here after finally doing research online. We were overwhelmed with the side effects we read about, especially how similar other girls’ adverse reactions were in comparison to my own. ) Within a month of my only Gardasil vaccine I was a completely changed, debilitated human being. During this period of many months, for twenty four hours a day, every moment of my life, I was nauseas, sick to my stomach and alternating puking. I could not drink water or eat anything without getting sick. Digesting anything was extremely painful and my stomach and body hurt excruciatingly. This was more pain and ongoing debilitating symptoms than I have ever experienced. It hurt and was very difficult to move, to walk or to do anything I could not even wear jeans around my waist for seven months because of how painful my stomach felt. I discovered new levels of dizziness and came close to passing out many times upon standing. I was losing weight rapidly, up to 15 pounds a month, with limited activity. Left: me in December 2010, one month before Gardasil. 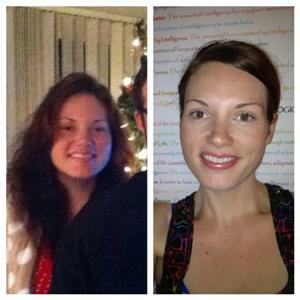 Right: a year and a half later, July 2012 after the extreme weight loss post Gardasil. I tried to focus and meditate healing into my body to counteract what was happening. I lost 100 pounds within that first year and a half. My diastolic blood pressure dropped to the 50′s/40′s. It used to be consistently around 120′s/60-70′s. My hair fell out at the rate of my weight loss – quickly. My tongue turned a grey black color in the center; my eyes turned a slight yellow. The acupuncturist, whom I was seeing before Gardasil, was documenting my progressive decline in health throughout these early months after my injection. My liver, spleen, kidneys, gallbladder, pancreas, and intestines were not functioning properly and under severe stress. I went to the hospital once for the pain in my right side and stomach, and was given morphine, pain pills and sent home without an answer. The most challenging and embarrassing issues were the gastrointestinal problems, which were horrifying on their own. Every time I had to use the restroom, it made me more ill than I already felt. The pain I experienced is something I will never forget. The pain in my stomach and body was disorientating every day. It physically hurt everywhere, my brain, mind and body felt foggy and deprived of energy and focus. I struggled to focus, verbalize my feelings, anxiety or frustrations because I felt so toxic and constantly overwhelmed within my own body. I was in more pain, more exhausted and more fatigued than I had ever felt. It was often overwhelming, especially trying to sleep with comfort or ease. Meanwhile through all of this, I was told by my doctors that I had Irritable Bowel Syndrome (IBS) and to go on a whole grain diet. That was the only advice they had for us, after all my symptoms, IBS. We knew we needed other help and resources. My family focused all of their efforts on helping me any way they could. I was already seeing an acupuncturist outside of my insurance every week and she was documenting my progressing issues as time went on. We bought vitamins, herbs, protein powders, digestive enzymes, probiotics, and fiber supplements to treat IBS issues. We began the first of many dramatic diet changes to facilitate gut healing. After months of using these products, they were helping on a small scale by not making things feel worse, with some slight benefits. The nausea and pain were still constant. My back and whole body were amongst the most excruciating pains and because of the pain, my mobility, energy and strength were limited. We decided to go somewhere else after that. We were at our tip of desperation after I returned from a two day trip with my fiancé. We went out of town to see friends. It was traveling, something I hadn’t done during this year of many changes. We were trying to make it work even with my health complications. It was wonderful seeing my friends, but my body could not recover from exhaustion after returning. We sought additional help. The physicians we saw during this time had not helped, many would not help and denied my symptoms. It was my acupuncturist, who stuck with us and tried to heal me. She gave me the name of a chiropractor in the area. One of our biggest blessings through this chaos was finding chiropractic care and meeting my chiropractor, Dr. McKillican. He recognized the crisis my health and nervous system were in and was the first sincere and genuine doctor that strived to help us. A chiropractor was not on any of my insurance or among the recommendations suggested to me, ever. In fact, I was advised to stay away from them earlier in life. The fifteen minute drive to their office, walking in and sitting down was excruciating, and with how my insides felt, I was deteriorating every day. We knew there, though, we had found a life-long missing link for health and healing. The adjustments I have had and which I am still continuing to have, have improved my health and lifestyle enormously. I know with my whole being that chiropractic saved my life, especially during this crucial time of debilitating disease and sickness. I have been getting weekly adjustments for nearly two years, beginning seven months after getting Gardasil. Chiropractic adjustments have made significant and dramatic improvements in healing and strengthening my nervous system and body. Regular adjustments work on our nervous system to remove nerve interference within us and to promote the body’s natural ability to heal itself. Nine months after Gardasil, I worked with a vital hematologist to detoxify my body naturally. We used a focused diet that included: juicing specific veggies, fruits, herbs, multiple vitamins, digestive enzymes, colloidal silver, olive leaf extract, glutathione, aloe vera juice. This regime greatly helped with my unbearable, chronic nausea. It seems to have reduced the intensity of pain throughout my stomach. I have had significant improvements in GI health. This past year and a half I also began working with a nutritionist to deal with the continuous mending needed to repair my GI and organ issues, adrenal dysfunction, low energy levels and fluctuations, memory, brain, cranial issues, appetite/food challenges and over all internal damages. I am thankful beyond words for the healing I have experienced, despite the pain and many challenges I have faced post Gardasil. My body is mending at the rate it can handle. I use my energy to focus on this. The issues I am still working on healing and mending are different two and half years after Gardasil. Now, I primarily deal with the autoimmunity changes and pain levels. These include: gastrointestinal issues, body pain, appetite dysregulation and the ability to eat enough, malabsorption of nutrients, low blood pressure and dizziness, energy, a strong sensitivity to cold temperature, smells and chemicals. Food and my appetite can be very overwhelming sometimes. It used to bring me to tears every day, especially my lack of desire to eat. I often don’t have the desire to eat or I get full too quickly. I also get really hungry all at once, often unexpectedly and painfully. The food and appetite issues are a constant work in progress that are still very complex. They have become somewhat easier to work with now than in the years before. I find focusing on ratios of carbs, fats and protein I need helps me, especially with my energy fluctuations. I have also eliminated foods with gluten, GMO or that are processed. I can no longer eat foods that are spicy or acidic. I eat raw organic veggies only – juiced because my GI tract cannot tolerate the un-juiced vegetables. I watch my sugar intake, including many fruits, and other foods that I am sensitive to. I eat whole foods, organic vegetables and fruits, good fats (grass fed/organic butter and coconut oil have helped immensely here) and as much healthy, grass fed, organic protein and protein shakes as my body needs to be balanced. All this has helped substantially. My healthy lifestyle is vital to keep my progress going. There is a combined effort of balanced nutrition, vitamins, medicinal herbs, supplements, regular chiropractic adjustments, lymphatic massages, physical therapy, removing as many toxins from my environment, and adding as much movement, exercise, walking or stretching as I can. I also use coffee enemas and drink alkalized water (and lots of it). My body now seems to be on the path it needs to recover from the atrocity that Gardasil caused. Every day is different with pain and energy levels, but I focus on the blessings, because I know how much worse it can be. I live in chronic daily pain, with pain levels, exhaustion and auto immune changes I never experienced before Gardasil, but these experiences have humbled me deeply in life and in the lives of my loved ones. It has taken a substantial amount of money, time and sacrifices from my extraordinary mother and fiancé to care for me post Gardasil. They help me daily with everything, especially during times when more help is physically needed. Without them, none of this progress could have been possible. I am more grateful and humbled than ever to be alive and for all the amazing, most abundant love and support of people I’m blessed to share my life with. I could not have come this far without these wonderful people. Gardasil changed my health, my life, and family’s lives forever; physically, mentally, emotionally, and financially. We have had to educate ourselves about health in ways we never did before. I have a humbled appreciation to be alive after how ill I was nearly three years ago. We have learned to educate, read, and research what we put into our bodies. We encourage everyone we know to do their own research on everything that is put into their body, especially through injection. The HPV vaccine adverse reactions will not stop until these vaccines do. What I can give and share with others through this experience is the truth, my experiences, and the real facts and statistics regarding Gardasil. I plan to do this until this vaccine exists no more. by Louise Kuo Habakus and Mary Holland J.D.